The Kinsman Farm is a six-acre “incubator” farm located in the Kinsman neighborhood of Cleveland, Ohio. 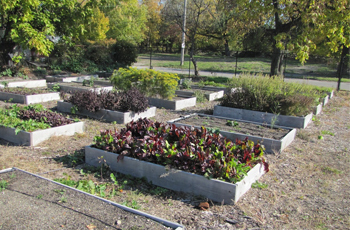 The City of Cleveland has identified urban agriculture development as a strategic component of its vision of the future. In order to develop infrastructure to encourage and support urban agriculture production within Cleveland, the Kinsman Farm was developed through a United States Department of Agriculture Beginning Farmer and Rancher Development Program grant along with additional funding from the City of Cleveland and the Ohio Department of Agriculture. One of the major barriers to urban farmers is land tenure. The Kinsman Farm was developed for small, urban farmers to overcome this barrier by providing a safety net for persons who have not yet farmed on a commercial scale to learn and grow their operations before attempting a larger tract of land. 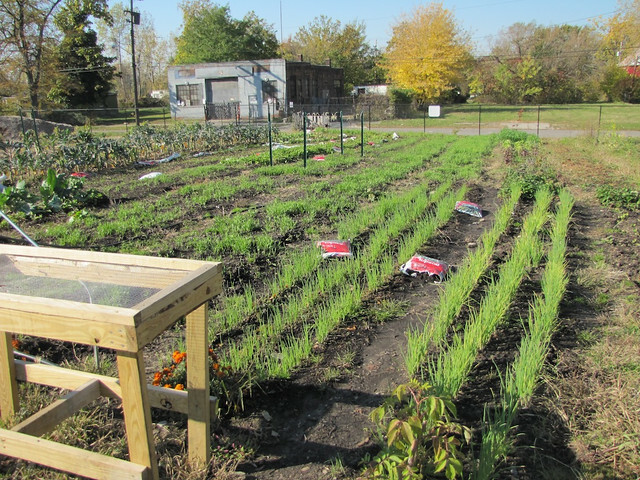 A large area of vacant land in the Kinsman neighborhood has been repurposed by the City of Cleveland as its Urban Agriculture Innovation Zone (UAIZ). This innovation zone is 26.5 acres of city-held land which is currently being developed for agricultural enterprises. It is hoped that the farmers on the Kinsman Farm will be able to expand their farm operations to larger parcels outside of the Kinsman Farm. The entrance to the urban agriculture innovation zone is on Kinsman Road and E. 82nd. In addition to Kinsman Farm, there is the Rid-All Green Partnership, an aquaponics training center, and the Northeast Ohio Regional Sewer District green infrastructure improvement effort which will improve storm water drainage and develop green space in the neighborhood. While not contiguous parcels, the six-acre Kinsman Farm is one of the largest urban farms in the United States. The land is known as the “forgotten triangle”, a neighborhood which encountered severe disinvestment over the past four decades. There were, and continue to be, many challenges with the development of the site, particularly with soil quality as the site was not used for farming for many decades. The site was cleared of debris, new soil and amendments were tilled into the soil, and the area was fenced. The farm partners continue to work diligently to improve the soil and the appearance of the site. In 2013, seven workshops on various topics of agriculture have been hosted at the Kinsman Farm. There are multiple seasonal high tunnels available to the farmers to extend the growing season in order to increase profitability. The Ohio State University Extension also maintains two small demonstration areas on the site to highlight small-scale agriculture innovations; produce grown at these demonstration sites is donated to local food banks. The Kinsman Farm is a unique partnership among the Ohio State University Extension, West Creek Conservancy, the City of Cleveland, and Burten, Bell, Carr Development Corporation. While differing in mission, these organizations hold a shared vision of creating opportunities for new and beginning farmers, meeting the demand for locally produced fresh product and reinventing the Kinsman neighborhood. Ohio State University Extension provides research based information and technical support to the Kinsman Farmers. West Creek Conservancy is the lease holder of the property and strives to promote sustainability of urban land. The mission of Burten, Bell Carr is to enhance the quality of life for the residents in Cleveland’s Ward 5; they have been very active in advocating for and introducing healthy food access initiatives. There are currently twelve farm operations with leases on the Kinsman Farm, including not-for-profit farms, partnerships, and sole proprietors. Each site is approximately one-fourth acre. Most of the farms are mixed vegetable farms. One farm is beginning a small-scale egg production, the first of its kind in the city of Cleveland. Vegetables produced on the Kinsman Farm are sold in many farmers’ markets throughout Cleveland. While the long-term goal of the Kinsman Farm is to be cooperatively managed by the farmers, there continues to be a need for administrative, financial and managerial support to ensure the long-term sustainability of the farm. We are committed to protecting and enhancing Greater Cleveland. We believe that clean streams and rivers, abundant natural areas, neighborhood green space, and beautiful walking and biking trails are an important part of healthy, vibrant, successful communities. If this sounds like a mission you want to be part of, then join our email list! Be the first to hear about our upcoming events, watershed news and ways you can help. Success! Check your inbox for a confirmation message.